Power-optimized, secure and extremely easy to use prototyping solution, dramatically simplifies the development of Proof-of-Concept (PoC) IoT edge nodes for consumer, commercial and industrial markets. NUREMBERG, Germany, Feb. 27, 2018 (GLOBE NEWSWIRE) -- (Embedded World 2018) - NXP Semiconductors N.V. (NASDAQ:NXPI), today announced its new Rapid IoT prototyping kit that unlocks the Internet of Things (IoT) to a broader spectrum of innovators. The power-optimized prototyping solution, intended to be secure and extremely easy to use, dramatically simplifies the development of Proof-of-Concept (PoC) IoT edge nodes for consumer, commercial and industrial markets. Rapid IoT accelerates the three phases of a typical PoC development to help even non-traditional technology innovators take an IoT idea to PoC quickly and easily. It combines optimized hardware design and trusted security with pre-programmed applications that help get users up and running within minutes of opening the box. The kit is extendable through a docking station and the MikroElektronika Click board™ range to create a virtually limitless number of applications. The Rapid IoT prototyping kit's drag-and-drop style GUI-based programming from Atmosphere IoT allows innovators to easily create their applications, even without embedded coding experience. Students and hobbyists, developers, platform providers, and engineers at start-ups or large enterprises can benefit from the reduced design time its user-friendly development environment provides. "Combining Atmosphere IoT's web-based IDE, Atmosphere Studio™, along with NXP's scalable and flexible portfolio has resulted in a tightly integrated solution that serves the burgeoning mass market community of IoT developers," said Jeff Liebl, CEO of Atmosphere IoT. 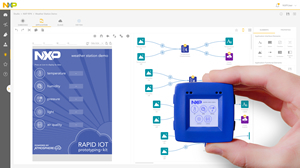 "The Rapid IoT prototyping kit reflects Atmosphere IoT and NXP's mutual vision of making embedded-to-cloud IoT development easy." Leveraging NXP's legacy of software enablement on millions of embedded devices, Rapid IoT has been designed to ease the transition from prototype to development with certified wireless stacks, drivers, middleware, embedded application examples and iOS/Android mobile apps. Automatic source code generation for NXP's MCUXpresso, a comprehensive and cohesive set of software development tools including an SDK, IDE, and Config Tools, further helps to provide a fast and easy transition for developers. "By bringing together the best of NXP's vast IoT portfolio to meet the market needs for security, sensing, processing and connectivity, and easing the design and software development cycles, our prototyping kit lowers the barrier to entry into the IoT market for new visionaries," said Steve Owen, Executive Vice President of Sales and Marketing at NXP. "Regardless of background or skill level, innovators can take advantage of the kit to quickly develop sensor to cloud solution prototypes, as easy as 1-2-3." NXP will showcase Rapid IoT in the Tinker Bar area of their booth, #4A-220, at Embedded World 2018. The Rapid IoT prototyping kit is priced at $49.99 and will be available for purchase in Q2 2018. To schedule a meeting during Embedded World 2018, please contact pr@nxp.com.